I have spent the last week looking for clues and writing test cases in order to find and fix the memory leak in Tendermint. For those of you who don’t know, Tendermint Core is a Byzantine Fault Tolerant (BFT) middleware that takes a state transition machine — written in any programming language — and securely replicates it on many machines. It is also the foundation of Cosmos — our solution for scaling blockchains. If you want to know the whole story, please keep reading. It all started with one of our users reporting a memory leak (thanks Martin), while he was trying to sync with the latest testnet (gaia-2). And 615MB after just a few minutes at block ~230k certainly does sound like one. Jeez! First thing I did is try to replicate this manually by spinning up a new node and connecting to the same testnet. I took advantage of existing http://localhost:46657/write_heap_profile?filename=_ RPC endpoint and created two heap dumps: one at the start, another after approximately 10 minutes of syncing. Then I compared them using go tool pprof. Immediately I noticed a lot of memory is occupied by newChannel and RepeatTimer. The trail went all the way up to the reconnectToPeer function. That was weird because we’re not creating any new peers (some of them were just failing due to timeouts and Tendermint tried to reconnect). Here I made a mistake. I thought I pinpointed the exact place where the memory is leaking. So I went and wrote a test case for p2p/Switch, where I create a peer, close the connection (simulate a timeout), wait until Tendermint reconnects and repeat this 100 times. Before and after, I took snapshots of the heap and later used them to find where memory is going. Indeed, the test showed leaking newChannel and RepeatTimer. But I still had no clue about why this was happening. I spent a few days reading various resources and source code, trying different instruments and asking people for advice on StackOverflow. In the process, I also discovered a great tool — leaktest, which does almost the same, except it removes runtime and testing related goroutines, so it’s easy to spot leaking goroutines. Plus it makes a test fail if in the end there are still some goroutines running. No useful results. However, now I knew it was not goroutines that were the issue. I figured out there must be something wrong with my test case. Of course! How could I be so stupid? The culprit was testing using TestReactor (spy), which keeps track of peers and does not remove them. TestReactor was the one holding reference to all peers (both added and removed). This is why Go was not able to garbage collect them. The mistake I was talking above was jumping to a unit test instead of writing an integration test. Then it all became clear. I knew what I needed to do. I should have written the same test case but for the whole program (basically wrapping main.main()) rather than something, which is using a spy (TestReactor). 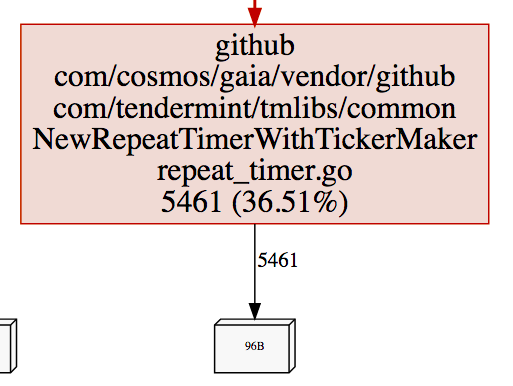 In case of Tendermint, the entry point (analogue of main.main()) is creating and running a Node. MempoolReactor creates a broadcast routine for each peer. It can block on an empty CList forever unless there are transactions coming in. And since there are no transactions during sync, this goroutine will just sit there, holding onto the peer too. If we’re constantly reconnecting to some peer, old instances are not garbage collected, leading to the memory leak. The leak was successfully fixed and included in the next release of Tendermint (0.16).